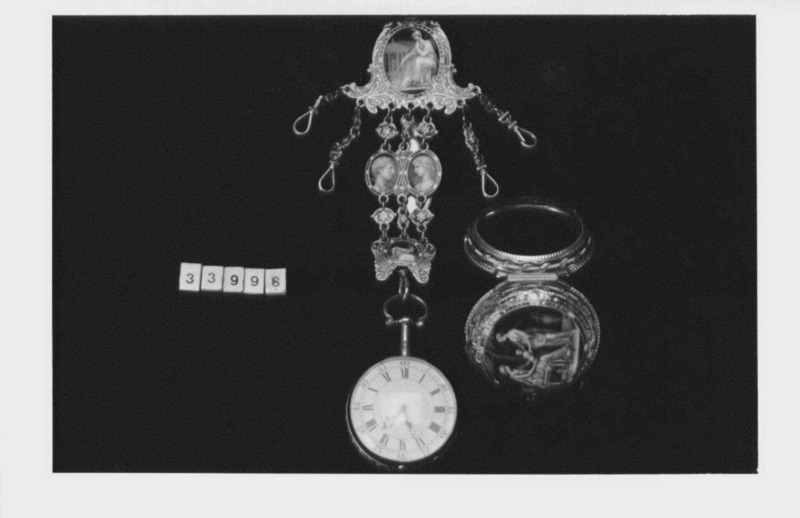 A repeating gold watch, the case chased and pierced with foliate scrolling and grotesque masks, with an enamelled outer case, attached to a châtelaine, elaborately enamelled in dark blue with cameo-style reserves showing figures ?Britannia, confronted male and female heads and a seated woman handing an infant to a nurse; with four chains. George Michael Moser (1706–83) was a renowned artist and enameller of the 18th century, father of celebrated floral painter Mary Moser, and, with his daughter, among the founder members of the Royal Academy in 1768. He was born in Schaffhausen, Switzerland and trained initially as a coppersmith in Geneva. He later learnt additional skills as a chaser, goldsmith and engraver. He moved to London during the 1720s and works by him include elaborate gold snuff-boxes and watch-cases including movements by noted watchmakers George Philip Strigel and John Ellicott. He was the Royal Academy's first Keeper and as a teacher at the Academy taught many notable artists including William Blake. William Dutton was apprenticed to George Graham in 1738, became a member of the Clockmakers' Company in 1746, and continued as journeyman with Graham until the latter's death in 1751. He was in partnership with Thomas Mudge, another Graham apprentice and journeyman from 1755 to 1771. The business was carried on at the Dial and One Crown in Fleet Street, (later 148 Fleet Street).